Somali regional leaders held a meeting in Kismayo, the interim capital city of Jubaland state on September 4-8, 2018, where they issued a statement to suspend all ties with the federal government of Somalia. The meeting was attended by the leaders of all five Somalia’s Federal Member States, Puntland, South west, Jubbaland, Galmudug and Hirshabeelle. The statement issued by the regional leaders was not something that was expected. This is the first meeting in which the regional leaders issued a statement to suspend their cooperation and relations with the federal government. The most that was expected from the meeting was for the leaders to issue a statement warning the federal government to change its course and asking the international community to intervene. Social media and Somali national TV were continuously reporting the excellent relationship between the federal government and the member states to the point where the federal government circulated pictures showing the president and/or prime minister meeting with member state leaders. At the last Somali forum held in Brussels, the government emphasized the improved relationship between the federal government and the member states. Also, the member states seemed to have no other choice but to work with the federal government, which appeared to be working hard to lessen the member state powers enshrined in the constitution. The regional leaders accused the federal government of not fulfilling the agreements reached at the previous conferences between the central government and federal member states, such as the conferences held in Mogadishu and Baidoa . It is also clear that, despite the federal government and international community insisting that an election based on one-person one-vote should be held, which is almost impossible, given what needs to be accomplished before that vote can take place and the performance of this government over the last year and a half. Most importantly, the regional leaders felt that the federal government is working against their existence by financing individuals within member states to disrupt the peace and security of the regional government. That seemed to be the straw that broke the camel’s back. However, to be fair, the regional leaders allowed themselves to be put in that position. The regional leaders allowed the federal government leaders to use them in instances where they were called to participate in conferences, where the only purpose was a photo op that would later be used to show the international community the progress the federal government is making toward cooperation. At the last meeting the federal government ministers held in Garowe on August 3, 2018, it was reported initially that the president of Puntland, Abdiwali Gas, opposed the meeting because of a disagreement. The prime minister was said to have worked hard for that meeting to be held so that the pictures and the documents stating that outcome could be used for the next proposed Somalia forum in December. The minute they realized the first agreement reached in Mogadishu had not made any progress, the regional leaders should have said something and not to accept any other invitation. Instead, they continued to attend conference the federal government called as long as the federal government paid associated costs such as transportation and hotels. The first few months the government was in place, opposition groups pointed out all the government’s faults and realized that the government was trying to dictate from Mogadishu. But the regional leaders ignored this as long as they were given recognition. Now the regional leaders want to shed crocodile tears, which the federal government has not responded to directly so far but indirectly as usual. Case in point, when it came to the surface that Abdikarim Sheikh Muse (Qalbidhax) was transferred to the Ethiopian government in August 2017, the president and prime minister did not come to the podium to address the public as to what took place. Instead, information was distributed via social media that showed Qalbidhax to be a terrorist. Similarly, when Abdishakur Abdiharman Warsame, the leader of Wadajir Party, was attacked in the middle of the night while he was in his home, the president and prime minister did not talk about it. Instead, they used social media to propagate his wrongdoing. Until now, they have not said anything. Now the federal government is using those who were embedded into the regional administrations to respond to any step against the federal government that regional leaders take. The minute the regional leaders’ statement was issued, Puntland vice president, Abdihakim Haji Amey, who is known to have been in Mogadishu at the time of Kismayo meeting; the vice president of Galmudug, Abdi Hashi Arabey, who is moslty in Mogadishu; and others have come out against the move. The president and prime minister did not respond directly as to what is being done about the situation. Instead of directly dealing with the regional leaders as whole and try to address their concern, the President anf PM of the FGS use divide and rule strategy within the region leaders. 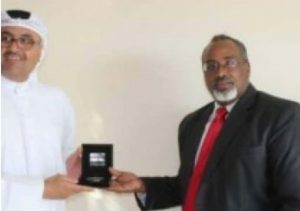 It was reported on September 19, 2018 that Hirshebelle president Mohamed Abdi Waare made a deal with the federal government after it was reported in media that Mr. Waare was offered over 2 million dollars by Qatar ambassador in Mogadishu. This follows after Prime minister insisted that he would not accept any international actors mediation. Even though the president and the prime minister have ignored the statement issued by regional leaders, the international community has expressed concern. Michael Keating, who was reporting to the Security Council as to what was accomplished and what needs to be done in order to move forward, noted the statement. Also, the United States’ representative to the UN, Nikki Haley, urged all the stakeholders to work toward peace and cooperation between the members states and the federal government. Now this conflict between the federal government and the member states is known internationally. The president is still ignoring the tasks he was elected to accomplish. The Somali president was expected to make sure that he works with regional leaders to develop a plan to secure the safety of the country. Instead, he wants to advance a policy dictated by the Villa Somalia. The president was also expected to work with Somaliland to unite the country. Instead, he is working hard [how [now that?]] Eritrea and Djibouti will have a working relationship. The finalization of the federal constitution, which supposedly was to involve all the stakeholders, seems to be being cooked in an underground room—not that many people know about the status of that constitution. The president promised that he would work with his prime minister if allowed to perform his duty, unlike all the previous governments. But instead, he let the prime minister alone to the point where every decision made in the government should be approved by the prime minister without the president’s knowledge. For example, on August 4, 2018, the Duty Minister of Foreign Affairs, Mukhtar Mahad Daud, was reported to have been visited by the police for corruption charges during the time the prime minister was in Puntland. He was later released after the prime minister called for his release, even though upon his arrival in Mogadishu Prime Minister Khaire approved the case to proceed. In another incident, on Sept 10, 20108, the Deputy Chief of the National Intelligence Somali Agency (NISA), Abdala Mohamed, was held at the airport days after he was fired from his position until the prime minister called for his release after a few members of parliament reportedly called the prime minister from the airport. With all these involvements of the prime minister, Somalia did not move one inch forward in terms of reconciliation, and the prime minister still sees a way out of this mishap. With that being the case, the president and prime minister need to come up with a new strategy. The strategy that Somali people need today is not something new, and it should be based on common sense that says one cannot build a house from the roof down; one must first develop a good foundation. Just because the Somali government is recognized internationally, it does not mean that the president and prime minister have the right to dictate all affairs from Villa Somalia. Somalia cannot be a government without Somaliland being on board and taking part in building the foundation blocks. Without a constitution agreed to by all stakeholders, there cannot be a government for the people. Reconciliation of the Somali people is the foundation of everything that needs to be accomplished. Thus, the president and prime minister need to come to their senses and realize that they are not smarter than everyone else and that Somalia can no longer be ruled with an iron fist. They should start reconciliation and allow others to participate, instead of the prime minister acting like a jack of all trades and wasting the two and half years left in their term.